These days I’ve been creating light dishes that are full of flavor. I had a nice jar of yellow tomato puree, and I wanted to build on its fine and delicate taste, full of Umami. I had several ideas and started cooking in my head – as I always do – while shopping, exercising, or picking up the kids. In fact, most of my recipes start in my head way before I start anything in the kitchen. Once in the kitchen, all these ideas come together and it’s not unusual for a recipe to be created in one session. 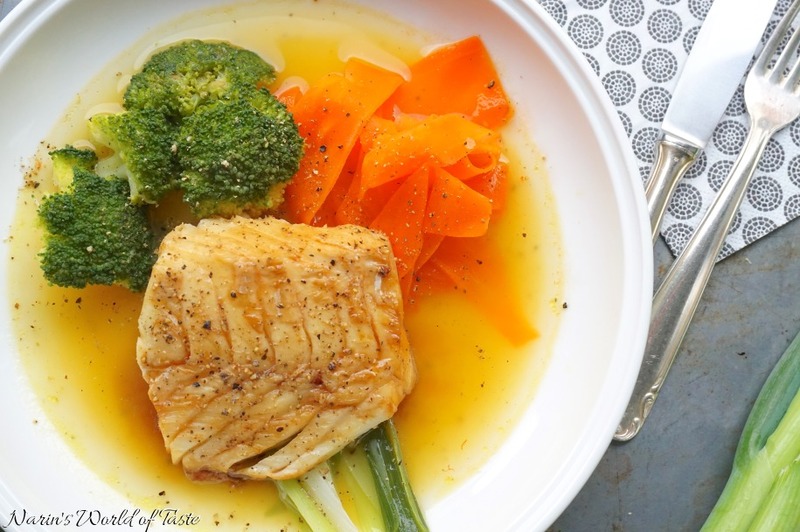 In this dish, the combination of ginger, herbs, homemade stock, and yellow tomato sauce is so flavorful, you can eat it with any kind of fish or vegetable that you like. 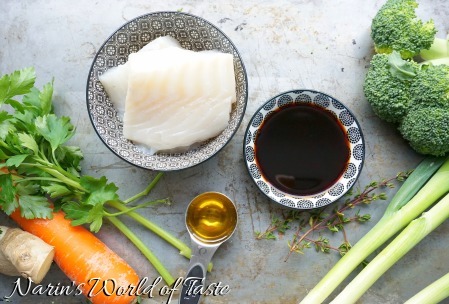 I steamed broccoli, spring onions, and carrots alongside oven baked codfish. Preheat the oven to about 180 – 200 degrees. Peel the ginger root and cut it into about 5- 7 pieces. Wash the parsley and thyme. 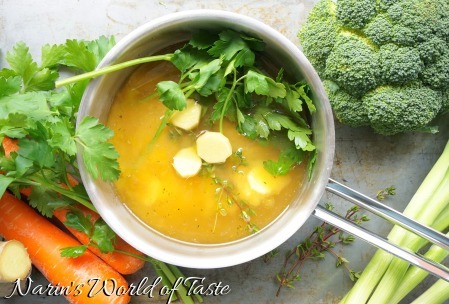 Use a small sauce pan and add the stock, yellow tomato puree, ginger root, parsley and thyme. Season with salt and pepper and bring it to a boil. Reduce the heat and let it shimmer. 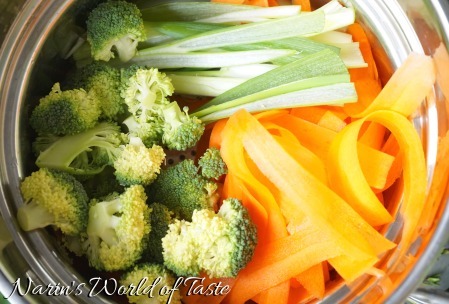 While the broth is simmering, wash the broccoli and cut out the florets and put them into a steamer. With a peeler, peel the outside of the carrots and put them aside, then continue to peel the rest of the carrots and add those peels to a steamer as well. Lastly, wash the spring onion stalks, cut off the root, cut them in half, then half again length-wise, and put them into the steamer as well. Steam them until just al dente. Wash the fish fillets and dry them with a kitchen paper towel. Combine the soy sauce and sesame oil. 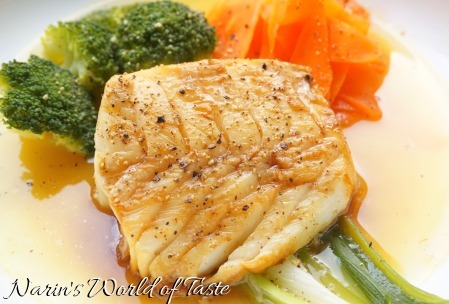 Add the fish fillets into a casserole and brush some of the sauce over the fish fillets. Put the casserole in the oven and let the fish bake for about 15 – 20 minutes. Glaze the fish again every 4-5 minutes during that time. Meanwhile, season the broth to your liking and pass it though a fine sieve leaving a clear sauce. For serving, ideally use a slightly deep plate. Add some of the broth, followed by the veggies and the fish. If you have some soy sauce left, you can brush a little bit over the fish on the plate. Season with some pepper and serve immediately. 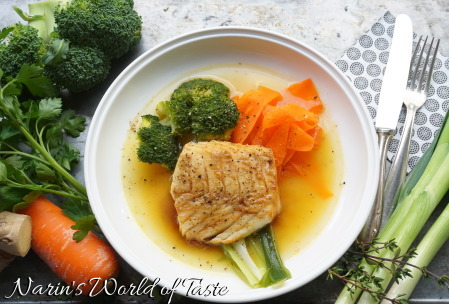 When Melanie first started with this, I thought “darn, what a boring dish she’s working on here – a bunch of steamed veggies and some white fish…” But then, when I got to try the sample plate, I was absolutely surprised. 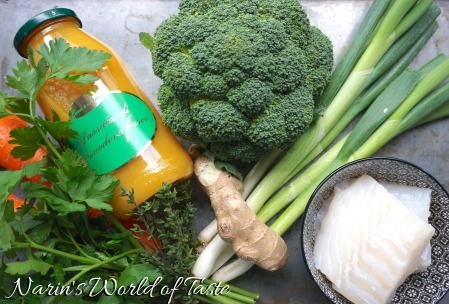 The broth is so flavorful yet subtle and fine, and perfectly complements the fish and the vegetables. Not boring at all. I felt great after eating it. Well done, Melanie! !